Core i7/i5/Xeon Socket 1156 support including accurate turbo mode reporting. New information window for NVIDIA GPUs with improved SLI support. Correct reporting of Super Low Frequency Mode (SLFM) for Core 2 mobile CPUs. Correct reporting of Intel Dynamic Acceleration (IDA) for Core 2 mobile CPUs. Added VID reporting to the main GUI for Core 2 based CPUs. Added a Fahrenheit=1 INI file option. 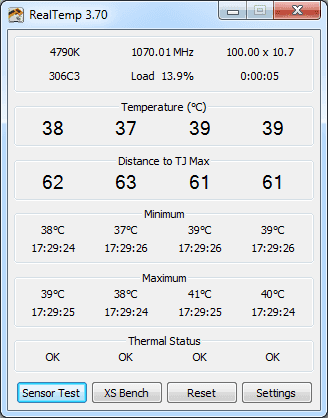 Added the option to view a Task Manager based or a C0% based load meter. Added the ability to toggle C1E state and view the SpeedStep (EIST) state. Improved dual and multi-monitor support including Anchor mode. Includes RealTemp GT, a 6 core version of RealTemp for Gulftown CPUs. Includes i7 Turbo, a high precision multiplier monitoring tool for all Core CPUs. Includes LoadTester, a variable load, single core testing program. Skull=1 or Skull=2 INI option for reading each CPU on a Dual Quad system. Thanks rge, burebista and somebody on TPU for all of your ideas and help.